Part of Bio and Beyond at Summerhall, Edinburgh. 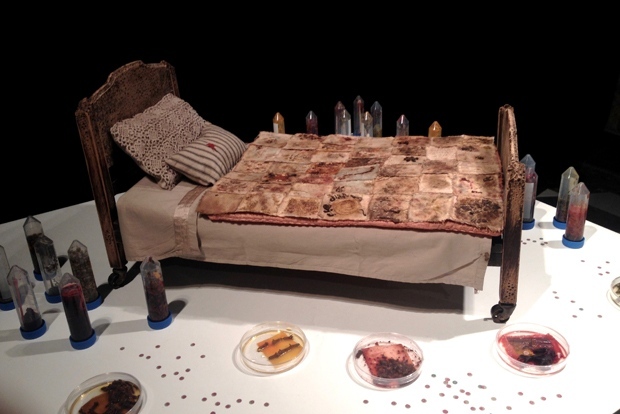 Menagerie of Microbes is co-curated by Heather Barnett and James Howie. For information please contact: mail [at] heatherbarnett.co.uk, howie [at] ascus.org.uk. As we go about our daily business we are surrounded by vast colonies of microorganisms, thriving communities existing largely out of sight. They may be small, yet in terms of impact and numbers, they represent the predominate form of life on earth. Menagerie of Microbes brings together the work of artists, designers and scientists who share a passion for these complex organisms, which exist in and around us. Exploring the talents, behaviours and inherent beauty of bacteria, fungi and amoebae, the exhibition celebrates biological form and function, and explores the future microbial possibilities for design, ecology and health. Combining works from different disciplinary perspectives, the exhibition also reveals different modes of creative inquiry – how we observe and interact with the natural world, and how we work with biological materials and systems in order to create, question or communicate. Menagerie of Microbes includes such delights as the experimental remains of bacterial warfare, artworks imbued with strains of Tuberculosis, explorations into biological communication, and designs for a new form of power station driven by slime mould. Anna Dumitriu presents selected works from her series of works exploring mankind’s strange relationship with the so-called ‘Romantic Disease’ Tuberculosis (TB), from early superstitions about the disease, through the development of antibiotics, to the latest research into whole genome sequencing of bacteria. Tuberculosis has been strongly linked to creativity due to its long association with art, literature and the Romantic Movement. Juxtapositions between historical artefacts and stories woven by the artist around our changing beliefs throw our idea of knowledge into question. The fight against TB is strongly linked to the science of microbiology and the development of antibiotics and vaccines, with current developments in whole genome sequencing focussed on understanding the disease better. Artworks include altered historical objects and textiles incorporating ancient treatments for the disease, such as dyes made from madder root and safflower, and textiles created using various kinds of mycobacteria. The exhibition also includes a new work, entitled “Burden” which focusses on the current global health impact of the disease. All of the material used in the exhibition has been rendered sterile using validated processes. Anna Dumitriu is a British artist whose work fuses craft, technology and bioscience to explore our relationship to the microbial world. She is artist in residence on the Modernising Medical Microbiology Project at the University of Oxford, artist in residence in the Department of Computer Science at The University of Hertfordshire, and an honorary research fellow in the Wellcome Trust Brighton and Sussex Centre for Global Health at Brighton and Sussex Medical School. C-MOULD is the world’s largest collection of microorganisms for use in the arts, with over 50 different biological specimens. The collection includes bacteria and fungi that glow in ethereal shades of green and blue light, bacteria that make gold and electrically conductive nanowires, and bacteria that produce biotextiles, along with the largest collection of pigmented bacteria. 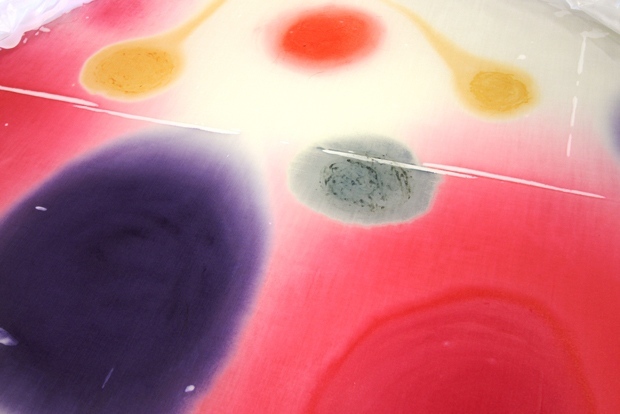 C-MOULD is created by Dr Simon Park, a molecular microbiologist, who has worked for over a decade at the fertile intersection between art and science. Exploring the aesthetics and processes of the usually invisible microbiological world, highlights from the collection in the exhibition include examples of bacterial experiments, biomaterials, microbiome representations and a bacterial biscuit recipe for good gut health. Dr Simon Park is a Senior Teaching Fellow at the University of Surrey, where he teaches Microbiology and Molecular Biology, and has been involved in many innovative art and science microbiology projects. He has also been a pioneer of Kitchen Microbiology, and through this, has empowered many enthusiasts and artists to carry out microbiology techniques safely at home, using readily available off-the-shelf ingredients. 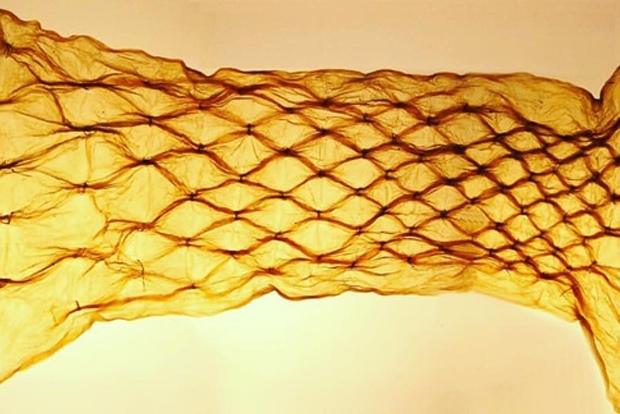 For some years Heather Barnett has been working with the true slime mould, Physarum polycephalum, observing and capturing its growth patterns, navigational abilities and seemingly human behaviours. Used as a model organism in diverse scientific studies, the single cell organism is attributed with a primitive form of intelligence, problem solving skills and can anticipate events. It is also quite beautiful, the dendritic patterns reminiscent of forms seen at varying scales within nature, from blood vessels to tree branches, from river deltas to lightning strikes. Her films, artworks and studies take inspiration from the diverse array of scientific research, which includes city planning, cellular computation and decision-making. As a process of co-creation, The Physarum Experiments is an exploration of the simple yet complex behaviours of this biological and cultural phenomenon. Heather Barnett is an interdisciplinary artist, researcher and educator interested in collective behaviour and living systems, often working in collaboration with scientists, artists, participants and organisms. 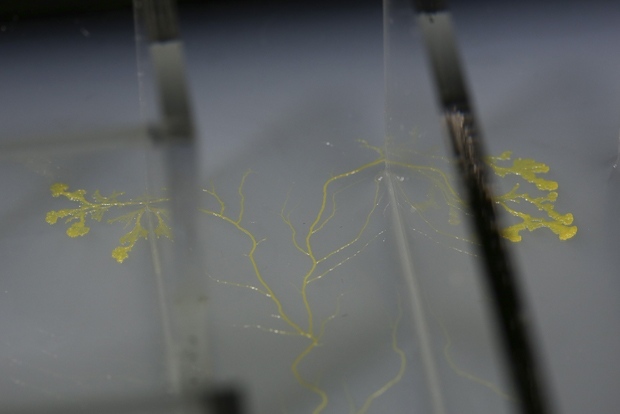 Employing a range of imaging technologies and biological materials, projects include microbial portraiture, cellular wallpapers, performing cuttlefish, and an ongoing ‘collaboration’ with an intelligent slime mould, Physarum polycephalum. Formed by the mighty power of a volcanic explosion in the Carboniferous age, then remodelled by the relentless action of glaciers in the Quaternary period, the peaks of Arthur’s seat are now once again transformed, this time by human technology in the new age of the Anthropocene. While solar and wind energy still sweep across the surface of the peak and marine mist incessantly moistens its bio-diverse organic cover, the Urbansphere of Edinburgh has expanded its bio-digital branches around it. Carving a dense web of redundant energy paths, these new power lines meet in a multiplicity of emergent nodes where the flows of information, matter and energy are at the highest level. These networks function like distributed autonomous brains, embedded in the landscape that they help reshape, always seeking to optimize their ability to absorb and metabolize the renewable energy that wind, sun and water tirelessly deliver to the most beautiful mountain of Edinburgh. A new kind of urban power station is born. ecoLogicStudio is an architectural and urban design studio co-founded in London by Claudia Pasquero and Marco Poletto. In recent years the studio has built up an international reputation for its innovative work on ‘systemic’ design – defined by the combination and integration of systemic thinking, bio and socio-logic research, parametric design and prototyping. The exhibition will display living artworks of vibrant colour, texture and form, using naturally occurring moulds and bacteria. 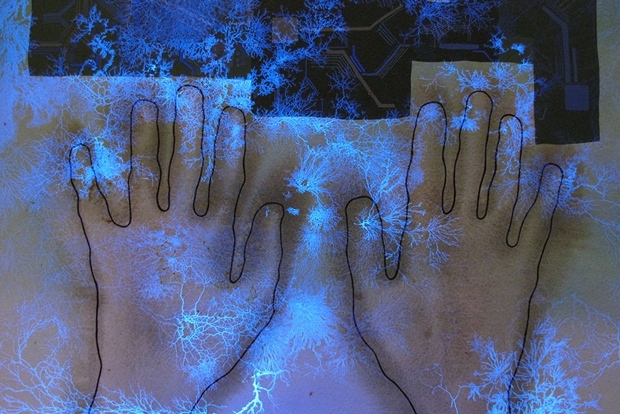 Techniques involve ‘bio-lithography’ – the printing of text and images using pigmented / bioluminescent bacteria – where the canvas is agar growth medium and the paint is living microbial colonies. Laboratory equipment and glassware provide housings for a series of microcosms and illuminated objects containing natural fluorescent proteins. Of particular interest is the cellular communication within microbial colonies, and the ability to transmit information through living cellular networks and potentially store data. 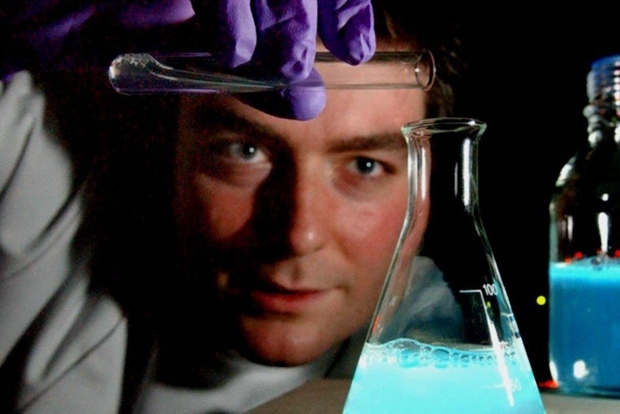 Dr Patrick Hickey completed a PhD on the cell biology of living fungi in 2001, and developed pioneering techniques for microscopic time lapse imaging of fungal growth. Patrick specialises in a diverse range of disciplines including biology, electronics and art. Projects include consulting for TV and film, novel LED lighting systems, art installations and guerrilla marketing projects including a bacterial/mould billboard for the movie ‘Contagion’. Do we know what we’re doing? Where we’re going? Where we’ve been? Do we believe the stories we tell ourselves about what we’ve done? How do we think about thinking about thinking? How do we put all our stories together? Spurious animal experiments are a series of paintings made in collaboration with the slime mould Physarum polycephalum. 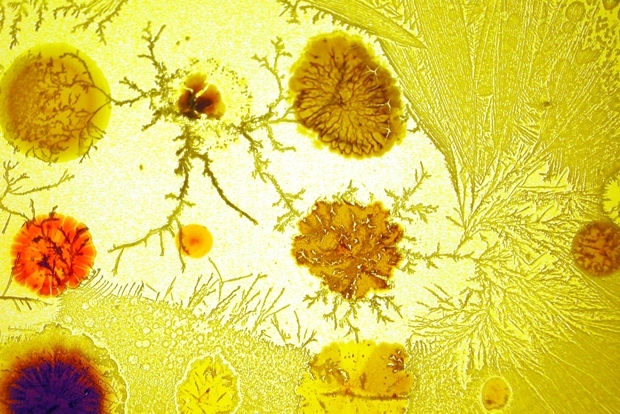 The paintings make use of a technique developed by Dr. Simon Park, where the slime mould is fed fluorescent powder. As the organism forages over the surface of the painting, a trail is left behind, visible only under ultraviolet light. Sarah Roberts is a visual artist with a practice centred around using pigments suspended in watery fluids to make sense of the world. This has led to a recent immersion in Botanical Illustration, one of the few remaining fields where images constructed by hand are still useful as data. A running theme in her work is to attempt to collaborate with other lifeforms, trying to find ways to physically engage them in order to understand them on their own terms. The Urban Morphogenesis Lab engages urban design as a computational practice to prefigure alternative models of the city, represented as a complex dynamic system. The Lab adopts computational, analogue, biological and digital design methods to draw terrains of negotiation between strategic and tactical forms of intervention. Algorithmic coding enables the study of biological models and the testing of iterative, adaptive and resilient design solutions applicable to a broader eco-social domain. It generates a multiplicity of responses and effects at scales ranging from the molecular to the territorial, from the quasi-instantaneous to the geological. 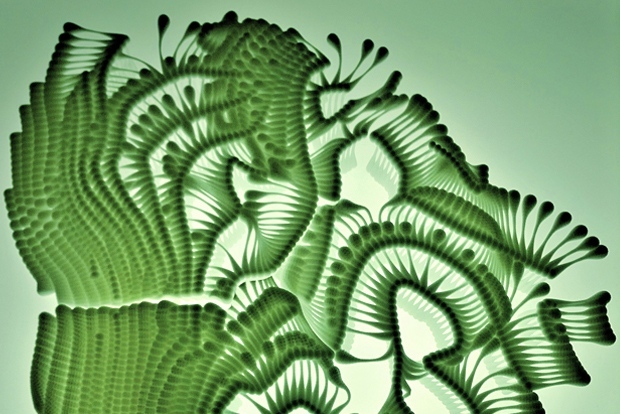 The Lab’s current design research focuses on how processes of bio-computation can have a radical effect in the way we can re-conceive contemporary cities. For Menagerie of Microbes the ASCUS Lab is hosting a number of workshops delivered by the contributing artists, scientists and designers, plus all manner of workshops, activities and events throughout the Edinburgh International Science Festival. The Lab will also play a supporting role in provision and caretaking of the many microorganisms involved in the exhibitions. The ASCUS Lab is the UK’s largest publicly accessible laboratory for experimentation in art and science, and it’s based at Summerhall in Edinburgh. The ASCUS Lab is also an idea, an idea that we should all have access to facilities where we can experiment and play in science and art, where they need no longer be so mysterious but are within our grasp. Established in 2015 and open throughout the year, the ASCUS Lab is a community space for people to produce, create, experiment, play, debate,research and more. It is a permeable membrane between academia and everyone else, where ideas and knowledge flow in both directions, often through hands-on engagement and collaboration. The ASCUS Lab also provides facilities to its community members for independent research.